D-Fend Reloaded wraps all DOSBox configuration functions in an easy-to-use interface. 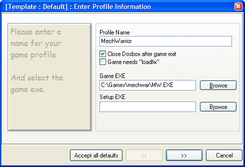 This page describes the Profile Wizard, which lets you easily set up a new game. When you open D-Fend you will be presented with a Windows Explorer-like interface. If you have used other emulators with frontends (such as MAME32 or MESS) you will have a general idea of how this interface works. First, click the Profile Wizard button. This will guide you through setting up a basic game profile. For more advanced configuration use the Profile Editor. Profile Name: set this to whatever you want. Close Dosbox after game exit: check this to return straight to D-Fend rather than to the command prompt. Game needs "loadfix": leave this unchecked. If the game closes straight after you run it, go to the Profile Editor and enable this feature. Game EXE: browse for the game's EXE (in this case C:\Games\mechwar\MW.EXE). Setup EXE: browse for the setup EXE. This makes running the setup at a later date easier. If there is no setup EXE for the game you are adding, just leave it blank. 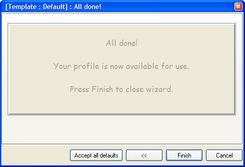 Accept all defaults: this makes the Profile Wizard automatically choose the standard settings. This will work fine for many games, but just as many will require manual setup. If you choose this option, skip to all done. Cycles: type auto. 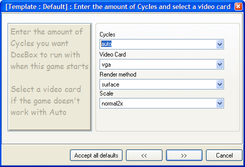 Cycles determine how fast the game will run, with higher numbers causing the game to run faster but also less smoothly. Using auto will let DOSBox automatically find the right speed for your system. If the game runs too fast you can come back here and manually experiment with a different number of cycles. Video Card: leave it as "vga". This is required by newer games, and will also run older games fine. It is only if the game uses Hercules or Tandy or doesn't want to work under vga that you need to change this setting. Render Method: leave it at "surface". If you have a good graphics card you can experiment with the other settings, but surface is the most likely to work. Scale: choose a scaling method. "None" will run the game at 320x240, "normal2x" will run the game at 640x480, and the other modes use various methods to smooth the pixels of the doubled image. Modes other than none and normal2x require more processing power, so unless you really want the game to look smoother you can leave this setting as it is. First, click Add..., then you will be presented with this box. Mount Type: leave at "Drive". 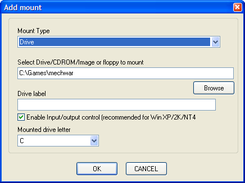 Select Drive... to mount: browse for the folder to mount (in this case C:\Games\mechwar\). Drive label: you won't likely need this, so leave it blank. Enable Input/output control: check this if you are running Windows NT, 2000, or XP. Mounted drive letter: leave this at "C". Type: for most games, leave this at sb16. Address: this must match the value set in the game's setup. 220 is the default. IRQ: this must match the value set in the game's setup. 7 is the default. DMA: this must match the value set in the game's setup. 1 is the default. HDMA: this must match the value set in the game's setup. 5 is the default. Opl mode: leave this at "auto" unless you have problems. Opl rate: If you want better-quality sound, change this from 22050 to 44100. Note that this will put a bigger drain on your system resources, so for some games you may want to leave it at the default to get better performance. Use Mixer: leave this enabled unless you have problems. 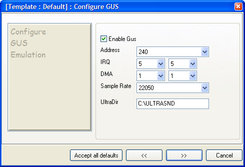 Here you can configure Gravis UltraSound. If this game does not use Gravis UltraSound, uncheck "Enable Gus". Address: this must match the value set in the game's setup. 240 is the default. IRQ: this must match the values set in the game's setup. 5 and 5 are the defaults. DMA: this must match the values set in the game's setup. 1 and 1 are the defaults. Sample rate: If you want better-quality sound, change this from 22050 to 44100. Note that this will put a bigger drain on your system resources, so for some games you may want to leave it at the default to get better performance. UltraDir: the location of the Gravis UltraSound drivers on the virtual drive. The default is C:\ULTRASND. You don't need to change MIDI settings unless they don't work correctly. MPU401: leave this at intelligent. 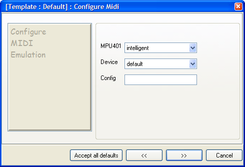 Device: leave this at default unless you have a special MIDI device you want to use. Config: this is for special parameters. For most games just leave it blank. 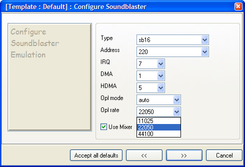 Enable PC Speaker: if this game does not use the PC Speaker, uncheck this box. Note that DOSBox emulates the PC speaker through your speakers rather than through your computer's real PC speaker. PC Speaker Rate: you can change the sample rate here if you want to, but this will result in sound quite different from that of a real PC speaker. Note that this will put a bigger drain on your system resources, so for some games you may want to leave it at the default to get better performance. Tandy Rate: you can change the sample rate here if you want to. Note that this will put a bigger drain on your system resources, so for some games you may want to leave it at the default to get better performance. 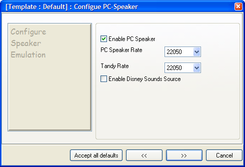 Enable Disney Sounds Source: most games don't use this, so you can safely uncheck it unless you know your game uses it. Memory (MB): for most games, 16 should be fine. For older games (especially CGA ones) you can set it to 8 instead. Many games won't need any more than 16 or 32 MB. The higher the setting the less RAM is available for other emulation uses, so keep this setting near the level of the game's "recommended" system requirements. Enable XMS: XMS (Extended Memory Specification) is a programming trick used to allow games to access more memory. Unless the game needs it turned off, leave this on. 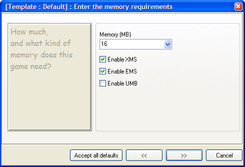 Enable EMS: EMS (Expanded Memory Specification) is a programming trick used to allow games to access more memory. Unless the game needs it turned off, leave this on. Enable UMB: UMB (Upper Memory Block) is yet another RAM-related programming trick. Unless the game needs it, leave this off. Congratulations, you've just created your first D-Fend configuration file! Click Finish and you will now see a new icon for the game you just set up. Double-click it to run it. For most games, this should work fine. If you have problems, or if you want to change more complex settings, you will need to use the Profile Editor. This page was last edited on 10 March 2010, at 19:38.